We’re conservationists and private citizens. We are your neighbors and folks down the road. 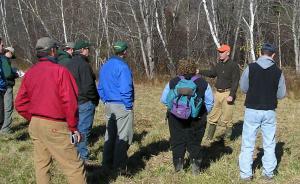 Many partners are working to create young forest: natural resource agencies, wildlife organizations, businesses, land trusts, the U.S. military, universities and colleges, foresters helping people manage their working farms and woodlands and vacation properties, and many private landowners who want to help wildlife. Partners are setting up habitat demonstration areas, to provide food and cover for local wildlife and to show how to create and renew young forest and shrubland habitat. Management techniques include timber harvesting (Guess what: Clearcutting isn’t necessarily bad! ), the careful use of fire, planting native shrubs, and using machines to chew down old shrubs so they grow back as dense, wildlife-friendly habitat. Please support conservationists as they grow young forest in your town, county, or state. Visit a demonstration area and see how vibrant these habitats can be. Maybe you’ll be inspired to make some young forest or shrubland on your own property. Most land in the Northeast is privately owned, so it’s vitally important for wildlife’s sake that landowners create and maintain young forest, especially on tracts 10 acres and larger. Check out the contacts page for folks who can point you in the right direction toward improving your corner of the world for wildlife. 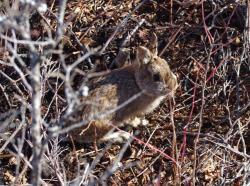 Contact your state wildlife agency for advice on making wildlife habitat. The U.S. Fish and Wildlife Service and the USDA Natural Resources Conservation Service help conservation-minded landowners help young-forest wildlife. Organizations like the Ruffed Grouse Society, Pheasants Forever, and National Wild Turkey Federation can also help. Licensed foresters can lay out and supervise a commercial logging cut that may pay for itself while improving conditions for wildlife. For non-commercial projects, full or partial funding may be available. A wildlife biologist explains how to make young forest at a habitat workshop. Young forest has dwindled in eastern North America. It’s a key habitat for many creatures whose numbers have been falling: wood turtles, ruffed grouse, American woodcock, golden-winged warblers, Eastern towhees, New England and Appalachian cottontails, bobcats, Canada lynx, and dozens more. More-abundant kinds of wildlife also need young forest at some point during their lives: white-tailed deer and black bear and mink and wild turkeys, plus many songbirds that nest in older woods but seek out patches of young, regrowing forest to feed on the fruits and insects associated with the plants that grow so abundantly in those light-filled places. Join us in helping to make sure these treasured wild creatures remain part of our region’s wildlife heritage now and for centuries to come.